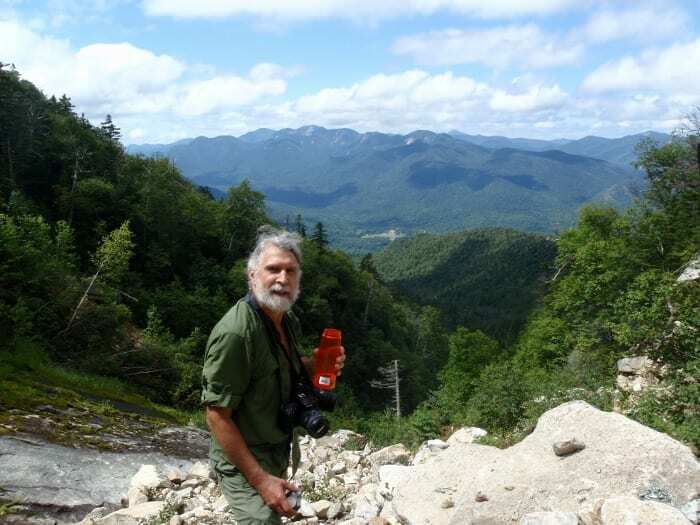 Last weekend, I climbed the Lake Placid slide on Whiteface Mountain with Sue Bibeau, who designs the Explorer, and her husband, Jeff Oehler. We paddled across the lake, went up the hiking trail for two miles, and bushwhacked up Whiteface Brook to the slide. The round trip took ten and a half hours, including a stop for refreshments in the summit restaurant. The mountain takes its name from this slide, which exposes the white rock (anorthosite) that constitutes the peak. At least, that’s the explanation I found in Peaks and People of the Adirondacks, by Russell M.L. Carson (1926). 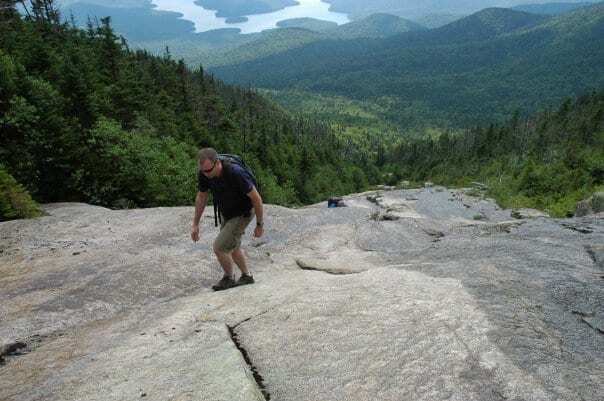 Carson also relates that Bill Nye, a celebrated guide (for whom another High Peak, Nye Mountain, is named), cut the first trail up this side of Whiteface in the 1800s. The original route brought hikers to the slide. I’m glad this is no longer the case, for one of the delights of slide climbing is solitude in a wild setting. Incidentally, the trail between Whiteface Landing, where we stashed our canoes, and the lean-to on Whiteface Brook has been rerouted in recent years. It used to cross the brook three times and now does so only once. 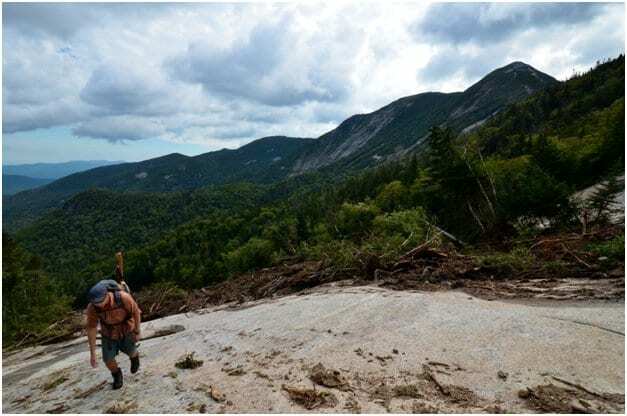 Alas, the new trail goes through some of the worst muck I’ve seen in the Adirondacks–and that’s saying something. DEC is aware of the problem. Look for my story about our adventures in the Explorer. Sue took some great photos, including the one of Jeff above. Love that pic. What slide number is that slide? What do you mean by “slide number”? It’s probably a class 3 climb, if that’s what you mean. There are 4 different slides. Each has its own difficulty level. 1 is the easiest, 2&4 are nearly vertical and 3 is intermediate. I just finished climbing No.3 this past Saturday 9/17/11. We got 3/4 way up and got stuck for the better part of an hour. Things got pretty scary. I was able to bushwack way my way to the top but the rest of the group had to use ropes and harnesses to get up a portion. Fair warning for anyone looking to climb Slide 3.